Home Food Omakase at Marukyu! : No Menu No Problem! Do you know someone who has trouble picking what to eat. You could watch them endlessly flip the menu pages before they finally select what to eat. Well there is a solution and it comes in the form of Chef Derrick and his restaurant Marukyu! It is the art of Omakase! Omakase at Marukyu! : It’s art. Its truly one of a kind! 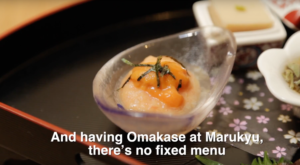 Marukyu is a Japanese restaurant that specialises in Omakase. It is a Japanese phrase that means “I’ll leave it up to you”. 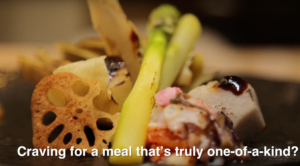 Customers who order omakase style expects the chef to be innovative and surprising. The meal is likened to an artistic performance that is performed by the Chef. In Marukyu, Chef Derrick is the artist and you are the viewer, as he flaunts and displays his 28 years of experience in fine Japanese Cuisine. No more waiting for choosy eaters! Omakase at Marukyu! : Only the most fresh for the best! Only the freshest ingredients are used! Marukyu offers one of the top Japanese cuisine in Singapore. Being one of the best, they must be using the best ingredients. 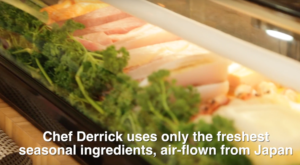 Chef Derrick only uses the freshest ingredients, airflow straight from Japan four times a week. It is with this, that he is able to craft and architect the cutting edge seasonal dishes that diners enjoy at Marukyu. Omakase at Marukyu! : I will leave it up to you! 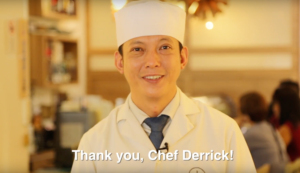 So bring you and your friend, and instead of waiting for him/her to choose a menu item, watch Chef Derrick work his culinary magic in the form of special multi course meal! Previous articleHealthy Scallop with Fruit Salad!